The Seer’s Stone. Locked away in a tower, young Isobel had watched its power slowly drive her mother mad. And now, years later, the Stone’s secrets threatened to be the death of Isobel as well. Douglas Stewart, known as the Black Wolf of Scotland, had no intention of taking a wife, despite his father’s demands. But the moment he saw Isobel, he was spellbound by her fiery defiance and delicate beauty. They were united by destiny yet beset by betrayal. Only by opening her heart to love and living up to her legacy could Isobel become a Warrior’s Bride. This was exactly what I was looking for when I downloaded it. I was in the mood for a sweet historical romance where the couple didn’t argue the entire time. I loved this story, mainly because of the female lead Isobel She was such a dynamic and powerful character, not for her strengths but for her faults. Isobel had been abused in her past and it definitely showed in her quirks and certain behaviors. She is such a great character because she is not perfect, she has weakness but she doesn’t allow it to stop her life. It was a nice change from the romance novels I read where the only issue with the “strong” female lead is that she has emotions over some man. Her husband, Wolf, was just as deep and complex as she was. He too seemed to break the mold that usually shapes historical romance male leads. The rest of the cast was just as interesting and complimented the story well. But it wasn’t just about the great leads, the story was fairly interesting, too. While not technically a fantasy novel, I enjoyed the magical and mythology that Russell created. The storyline was involved without being overwhelming or drowning out the romance aspect. If you want a lovely read to warm your heart with complex characters who are realistic with faults and strength, this is definitely for you and I highly recommend it. 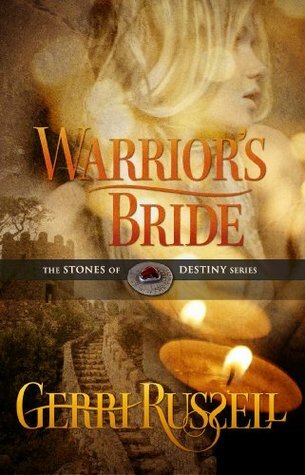 This entry was posted in Features and tagged book review, book reviews, Books, gerri russell, historical, historical romance novels, magic, reading, romance, warrior's bride. Bookmark the permalink.